James Eagle looks exactly like you’d expect an indie Melbourne artist to look. Relaxed, friendly, cool in an accidental sort of way, the human opposite of a corporate lawyer. We’re meeting at Addict, a typical Fitzroy café that sells relaxed and friendly food to relaxed and friendly people. James walks in wearing a blue cap and grey t-shirt. He’s on his lunch break. 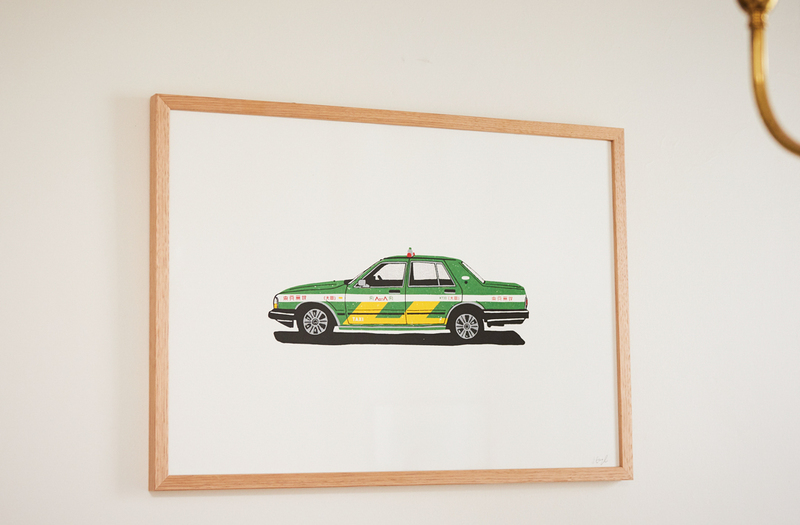 James Eagle is a full-time screen printer, which is a bit like being a full-time blacksmith or fax machine manufacturer. It’s an old technology, developed in China around 1000AD, and these days it’s been overtaken by faster, cheaper (usually shittier) digital printing techniques. But James is one of a few boutique operators trying to drag screen printing back into the mainstream. 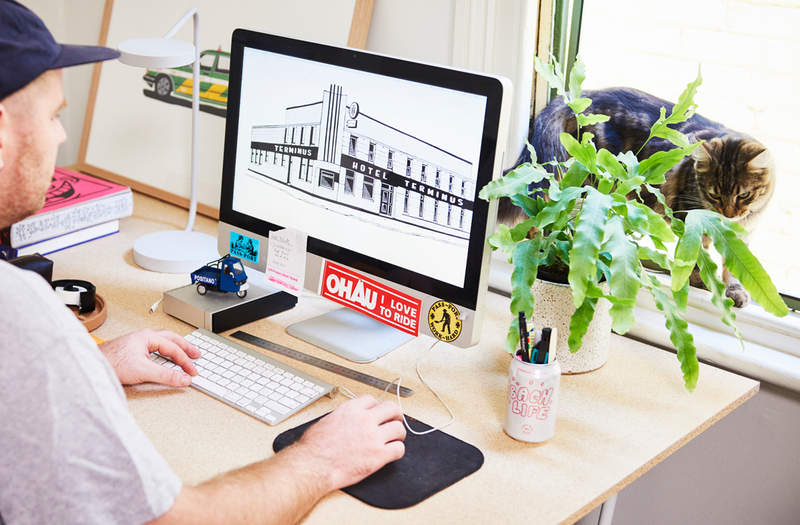 In fact, he’s made a sustainable side-hustle out of it, drawing freelance logos and illustrations for a bunch of Melbourne clients, particularly in the food and beverage space (Melbourne cafes being one of the few industries on Earth where authenticity and street cred really do trump cost). 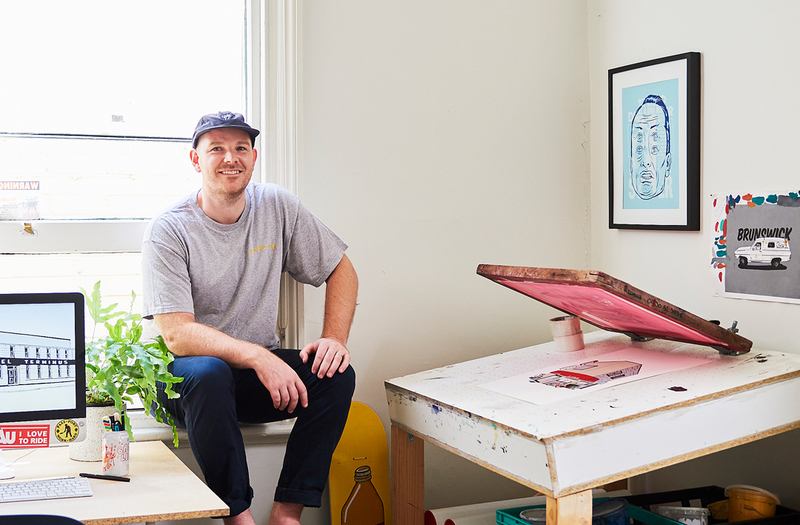 I sat down with James to chat screen printing, side hustles, and why it’s so important to do your own work for no money. So, walk me through your day job. Yeah, I’ve been a screen printer for the last four years. It was my hobby and now it’s turned into my day job, which worked out really well. On the side I freelance, which usually means a bit of graphic design, logos and branding or illustration. How did you get into screen printing? I moved to Melbourne maybe eight years ago. I did a bunch of travelling before that, and I always had a sketchbook on me. Did a lot of drawing and stuff. And I was thinking I want to turn that into a career, so I went back to school in 2012 and studied graphic design. And it’s just been hustling and pushing it since then. I’ve been lucky really. Because I do personal work as well as commercial screen printing, people have seen that and come to me for commissions. I was in Japan in 2017, and I came back really inspired by the trip, and from Tokyo in general. I worked on a series of Japanese screen prints, which was really fun, and people saw them and it kind of took off from there. 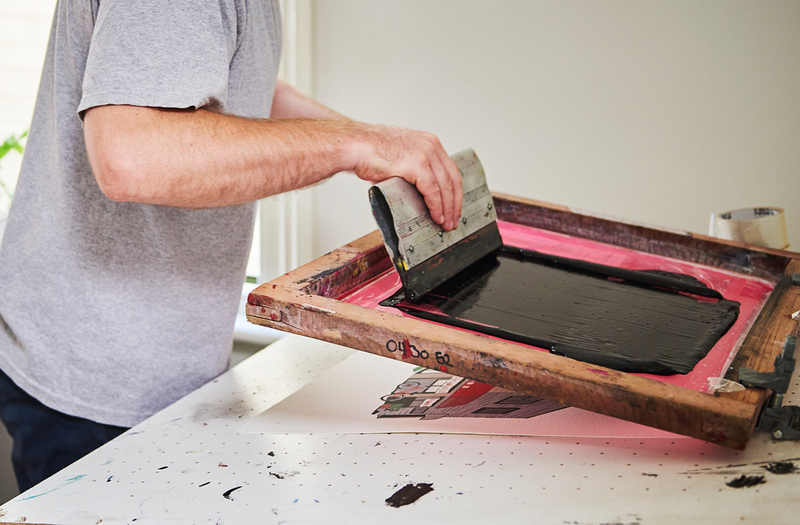 Is there really a demand for screen printing? What even is screen printing? There’s definitely a demand for t-shirt printing these days, which is something screen printing is really good at. But in my personal work I do a lot more paper screen printing, and there’s not a massive demand for that. But for me, it’s got a different feel. It’s hard to explain. You can really see and feel the ink and the paper. It’s not like a standard digital print. It’s got that nice, tactile finish. Here’s how it works. You have your design, and you print that out onto a transparency, a bit of transparent paper. You put that onto an exposure unit, which is pretty much a big lightbox, and then you put your screen (which you’ve already covered with photographic emulsion) on top of your negative. You turn your exposure on and the box lights up. The image is sort of burned onto the screen. Then you take that screen and wash it out with water, and your image is left behind. It’s pretty much like a traditional photograph. I like having this final product that you’d put all this effort into. It’s not quick or easy, you don’t just push a button. And it’s kind of unlike any other printed material. You can really see the ink and the texture. There’s something special about it. I think when people see the print, they can tell the difference. These days I’ve got my little home set-up. I made a small lightbox and I do my screen printing on that. Anyone can give it a go. There are Youtube tutorials and stuff online if you want to learn how to do it. You’ve been doing some branding work for bars and cafes around Melbourne—do you think there’s more opportunities for local artists these days? Yeah, I think there’s a bit more opportunity for young illustrators these days, especially in the hospitality space. I’ve been pushing my freelance stuff for about four years, and it’s really starting to pick up now. I’ve just finished a job for The Terminus. I think they’re going to pop it on some t-shirts and business cards and stuff, which is cool. I also did some branding work for Burnside, which is a local café. The Terminus saw that and asked me to illustrate the front of the pub, so it’s all kind of word of mouth at the moment. My style’s changed a lot since the early days, even in the last couple of years. But having the computer as a tool is a massive change, compared to drawing everything by hand. I still do a lot of work by hand, but I can now put it into the computer and add texture and colour and layers. I’m probably a bit more confident in my style now. Back when I started, I was still figuring out what I wanted to do. I’d say I’m inspired by the random moments in the everyday. Usually with a human element or sense of nostalgia. Who are some artists you’re digging at the moment? There’s a studio in New York called Morning Breath Inc. I really like what they do. They do client work, like branding and illustration and stuff, but also have their own projects. Just for them. They do a lot of shows. It’s cool to see an agency doing not just client work, but also personal work. That personal work is also very similar to their client stuff, which is good to see. That’s always a hard balance to get right. Got any tips for young illustrators who want to get paid to draw? For me, the big thing was doing work for myself. The personal work. I did those screen prints from Japan and took them to markets and stuff, sold a few of them, then people started finding my stuff and came to me for similar work. I reckon just pushing your own work is really important. If no-one’s going to pay you to do a job, create one for yourself. Screen printing has always been my side thing, so I was never relying on it. It’s always been enjoyable for me, as a passion project. Getting paid for it is just a bonus. Check out more on Jame and his work on his website jameseagle.com.au. In the mood for art now? Here are the best exhibitions happening around Melbourne this month.